If searching for a unique place to marry in Northern California this summer, Lake Tahoe embodies a spectacular site located high in the Sierras that’s unmatched to most any around. Perched above the alpine lake at an altitude of over 9,100 feet is an impressive overlook consisting of the very spacious mountaintop Blue Sky Terrace, a private area on Heavenly Mountain that’s encompassed with natural beauty, providing exquisite views as far as the eye can see. 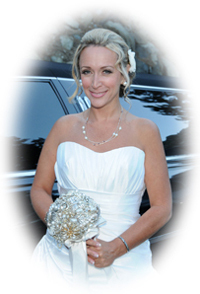 This amazing wedding venue is sure to excite most any bride and groom, and because it rests among the striking mountainous terrain of the prominent Heavenly Mountain Resort, it is certain to deliver an incredible experience and a day always reminisced. The hillside setting is one of serenity and bliss, and the elevated picturesque sights will have you feeling as though you’re on top of the world. The journey will begin with an approximate fifteen minute scenic gondola ride. The starting point where the swift moving cabins are boarded is situated at the base of the hill. 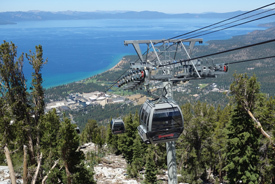 The gondola car will take you and your guests for an exploratory adventure up the rugged Sierra slopes, uncovering visions of the pristine countryside that surrounds Lake Tahoe, including shore to shore views of the lake’s colorful water and the adjacent Carson Valley. Once you reach your destination at the midway station, you’ll disembark onto the observation deck that will lead you to where your aisle of matrimony awaits. The overlook of the ceremony terrace will provide additional panoramic sights, and at conclusion of the ritual the astounding backdrop will be part of the formal photographic session, which entails photographing of the bridal party, the guests, and intimate shots of just the bride and groom. Of course, the ring and vow exchanges are also captured in addition to the candid photos. 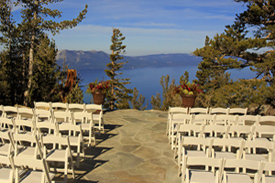 Reservations for a mountaintop Blue Sky ceremony consist of private and exclusive use of the area. 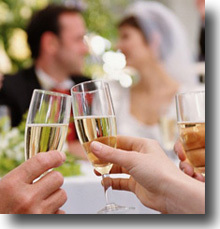 Other amenities included with the offered ceremony packages are gondola tickets for the bride and groom and each of their guests that allow passage to the site, chairs for all attending the event, a PA system for background music and champagne toasting speeches, choice of a number of appetizers, and complimentary alcoholic beverages. The Blue Sky Terrace is available during the summertime only from approximately June through September and there are limited weddings conducted per day, so prudent and early planning is recommended. This elevated and extraordinary ceremony venue is one of a kind, a unique place in the Sierras of Tahoe that the married couple will always appreciate when ruminating about the very special day their individual lives began as one.